Where to stay in Madrid? It’s a question I get asked nearly every day! The real answer is– it depends. Luckily, Madrid is home to some of the most charming, historic, and trendy neighborhoods in all of Spain– Amy shares her favorites below! The first time I visited Madrid I have to admit I was a hopeless tourist. Having done minimal research before making the trip up from Seville, my study abroad buddies and I booked a cheap youth hostel and wandered aimlessly through the city hoping to see something interesting. The result: an absolutely underwhelming impression of the Spanish capital. Now after getting to know this storied city over the past three years, I can’t imagine living in any other city in the world. Each of Madrid’s 21 districts has its own style, vibe and culture. From the hipster cafés of Malasaña to the centuries-old plazas of La Latina, there is a neighborhood for every taste and mood in Madrid. Whether you are in town for one night or 20, this guide on where to stay in Madrid can help you choose the barrio that suits you best. From the iconic Puerta del Sol square which marks the “center of Spain” down to the bustling Gran Via (Madrid’s main avenue), downtown Madrid is always full of energy. 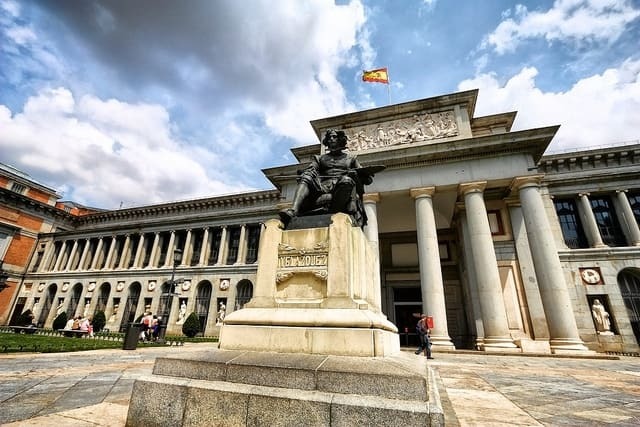 Many of the city’s main sights are located in this neighborhood, meaning you’re within walking distance of Madrid’s must-see places, everything from the Prado Museum to the Royal Palace. Where to Stay: The main avenues of downtown Madrid are lined with luxury hotels while this neighborhood’s side streets hide a wealth of guest apartments and youth hostels. Recommended: The Hotel Emperador on Gran Via is amazing in summer, as it has a rooftop pool with views of the city! And The Principal is a beautiful boutique hotel with a rooftop terrace to die for! Where to Eat: No trip to Madrid would be complete without a steaming cup of the city’s traditional thick hot chocolate with crunchy churros. One of the best spots in the city to indulge in this treat is Chocolateria San Gines just off of Calle Mayor at Pasadizo San Gines, 5. For fantastic tapas and raciones, try Lambuzo on Calle de las Conchas, 9 which specializes in southern Spanish cuisine. 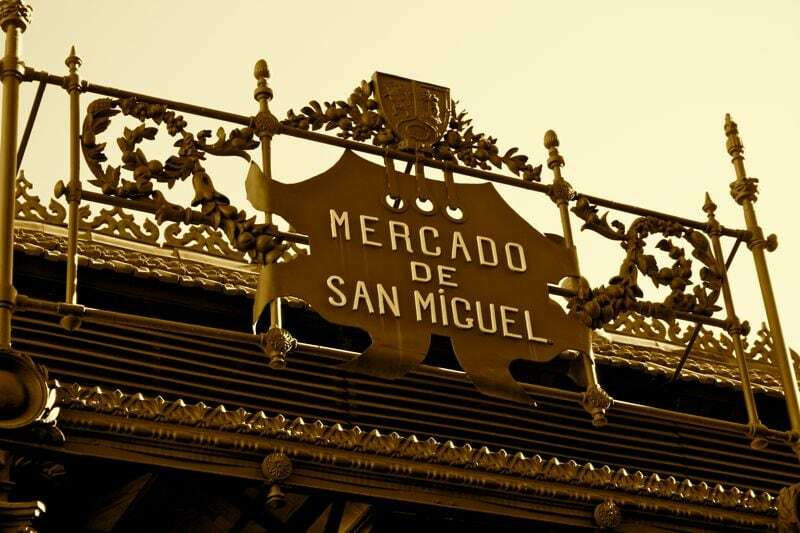 And the San Miguel Market next to Plaza Mayor is a must for foodies! 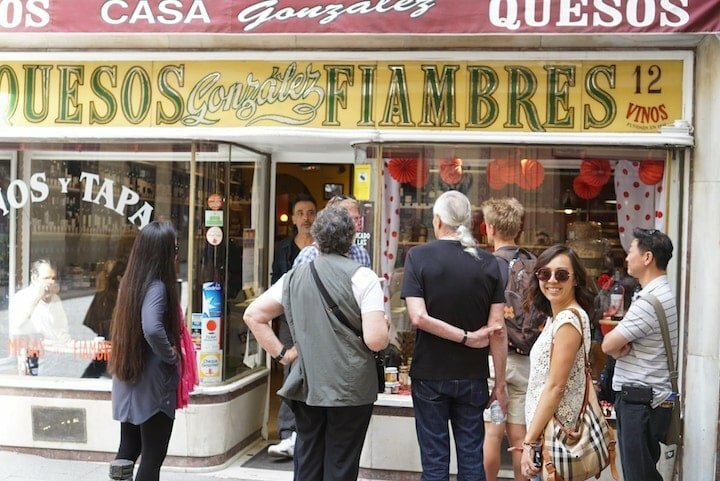 Insider Tip: To experience Madrid’s amazing food in one experience, try a Devour Madrid Food Tour! A giant market dedicated to fresh products and tapas. Where to Drink: The Museo Chicote on Gran Via, 12 is a newly reformed icon of Madrid cocktail culture. Another classic is Cafe Central at Plaza del Angel, 10, whose small stage and cozy red leather booths are a must for Madrid jazz lovers. For a rougher-around-the-edges option, head to La Venencia, a sherry bar and old haunt of Earnest Hemmingway. This is the oldest neighborhood in the city. Bricked streets snake in spaghetti-like fashion among centuries-old churches, sun-filled plazas, and colorful apartment buildings. Traditional tapas bars speckle these streets and waves of locals and tourists alike hop from caña to caña most evenings. Where to Stay: This ancient part of the city has many newly remodeled hotels and apartments that conserve the antique feel of the area. Recommended: The Posada del Dragon Hotel is a gorgeous space in one of Madrid’s old reformed buildings. This boutique hotel also has a tasty tapas bar below! Where to Eat: La Latina is one of the top neighborhoods in Madrid for tapas hopping. Tapas bars line the Calle Cava Baja and are thickly distributed throughout the many side streets in La Latina. This neighborhood is also home to the giant El Rastro flea market on Saturday and Sunday mornings. Read More: For specific recommendations on bars and restaurants in Madrid’s La Latina neighborhood, check out Where to Eat in La Latina. Where to Drink: Sunny Sundays are when La Latina really comes to life. 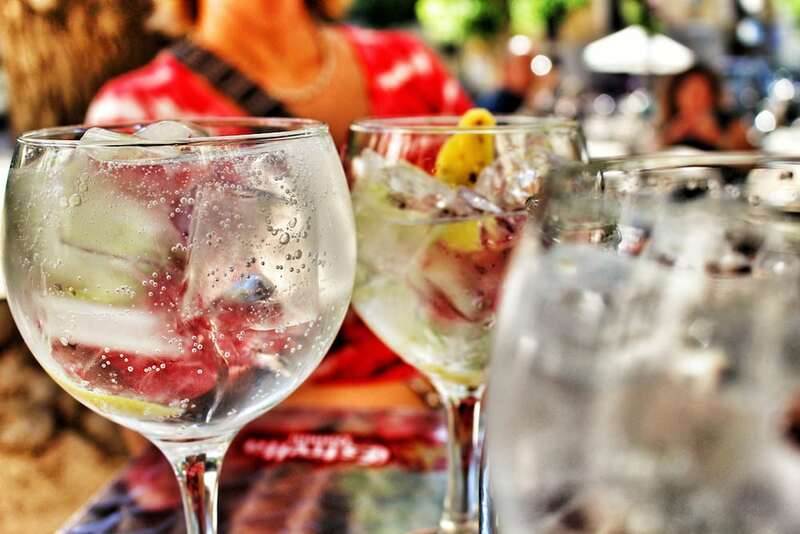 Gin and tonic drinkers fill Plaza de la Paja to soak in the afternoon sun. Friday and Saturday nights you’ll find Calle Cava Baja and the surrounding streets packed to the brim with people sipping small cañas of beer or glasses of Spanish wine. Located just north of the dead center of Madrid, Malasaña is easily one of the trendiest neighborhoods in the city. It is packed with cafés, boutiques and bars. Where to Stay: In Malasaña, boutique hotels mingle with hip youth hostels to make for a huge variety of accommodation options! Recommended: Hostel CC Malasaña is a great budget hotel in the neighborhood, perfectly located for shopping, dining and nightlife. There are kitchen facilities too– great for enjoying market fresh Spanish goodies instead of eating out one night! Where to Eat: If hipster dives are your thing, then Malasaña is your barrio. From the excellent cafes at Toma Cafe on Calle Palma, 49 and La Bicicleta on Plaza San Ildefonso, 9 to traditional taverns like Albur on Manuela Malasaña, 15 and La Dominga on Calle Espiritu Santo, 15, there is no shortage of great places to eat at all hours of the day in Malasaña. Where to drink: Whether it’s a glass of vermouth before lunch or a cocktail at the wee hours of the night, Malasaña is hopping at all hours of the day. For trendy cocktails, try the 1862 Dry Bar on Calle Pez, 27. For low-key, midday vermouth and great tapas go for Bodega de la Ardosa on Calle Colon, 13 or the classic Casa Camacho on Calle San Andres, 4. Chueca is a neighborhood with a bit of everything, from stylish wine bars and designer shoe shops to bumpin’ gay bars and 24-hour churches. Chueca is known as Madrid’s gay neighborhood and thus is packed with bars, nightclubs and colorful shops. 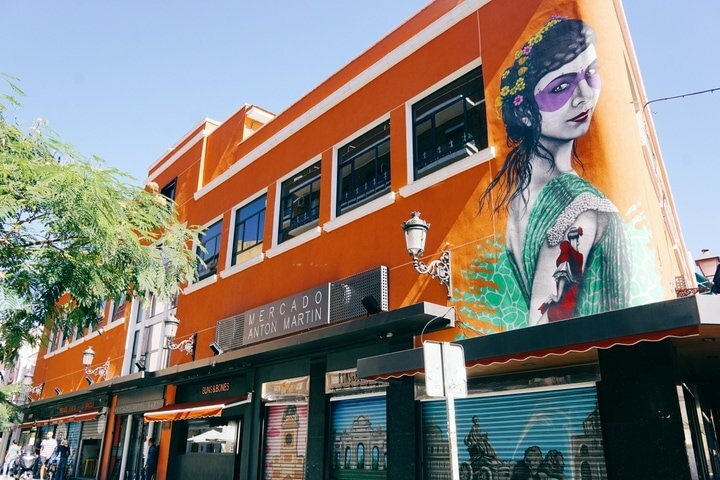 Here you’ll also find some of the city’s most high-end boutiques along Calle Barquillo along with a new revival of upper-end bars and restaurants. Where to Stay: There are two sides to Chueca: the party heart of the neighborhood closer to Calle Hortaleza and Plaza Vazquez de Mella which is packed with hostels, and the more elegant (and expensive!) area nearer to Calle Barquillo where you’ll find swanky hotels. Recommended: The Only You Boutique Hotel is a stunning space on Chueca’s trendy Calle Barquillo. Where to Eat: Bars and restaurants are in abundance in Chueca, which offers one of the widest varieties of price points and styles of any neighborhood in the city. For one of the best market-fresh meals in the city, try La Carmencita on Calle Libertad, 16. Stellar tapas and vermouth abound at Celso y Manolo, also on Calle Libertad at No. 1. For tapas, try the Mercado de San Anton’s second-floor tapas stalls. Where to Drink: Wine lovers will delight in the extensive list of Spanish wines available at Vinoteca Vides on Calle Libertad, 12. For classy cocktails try Hat Bar on Calle San Lorenzo, 5. Vinoteca Vides is a wine lover’s dream come true! 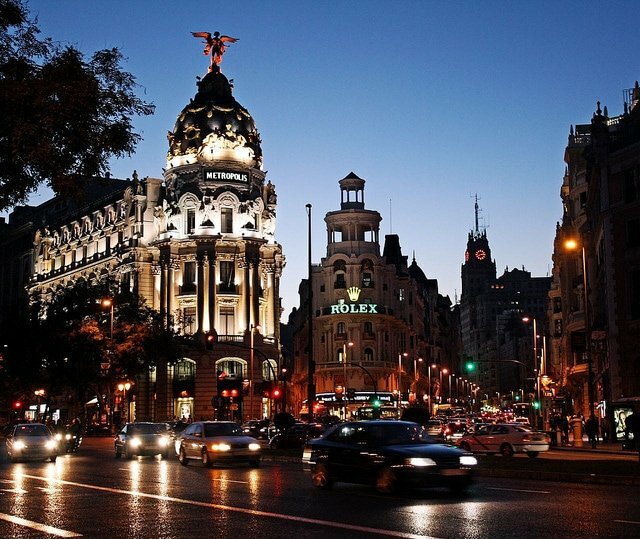 High-end shopping is the name of the game in Madrid’s ritziest neighborhood: Salamanca. The elegant district was originally planned out by the Marquis of Salamanca in the late 19th century, who wanted to create a neighborhood that lived up to the luxury of his newly-built mansion (now the BBVA bank headquarters on the Paseo de Recoletos, 10). Where to Stay: Some of the city’s nicest hotels are tucked into the tree-lined avenues of barrio Salamanca. Recommended: The Gran Melia Fenix and the Hotel Villa Magna are both considered among the best places to stay in Madrid. Where to Eat: Michelin stars abound at the restaurants in Salamanca. From the two-starred Santceloni on the Paseo de la Castellana, 57 to the newly annointed Albora with one star on Calle Jorge Juan, 33, this neighborhood is without question the place to be for luxury eating in Madrid. Also be sure to try StreetXO, the “street” version of Madrid’s only 3-Michelin starred restaurant, on the rooftop of Corte Ingles Gourmet Experience on Calle Serrano, 52. 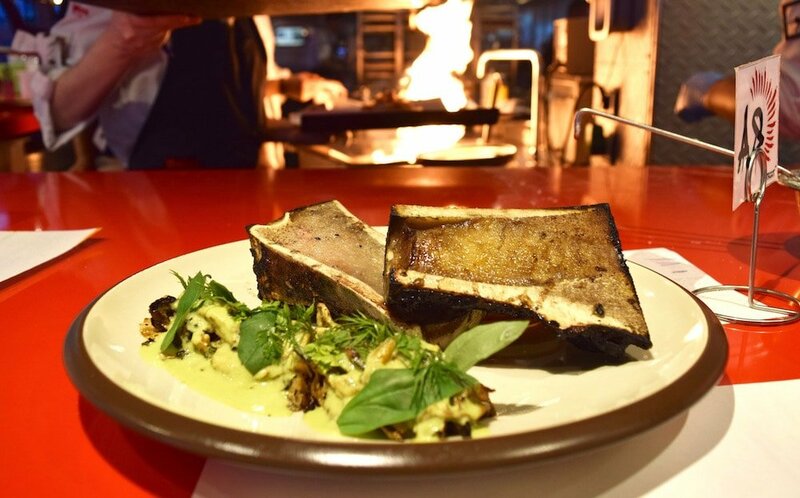 Fire-grilled bone marrow with churros and green curry at StreetXO. Where to Drink: For trendy happy hour cocktails, Otto on Paseo de la Castellana, 8 is the new go-to. The giant luxury market, Platea on Calle de Goya, 5-7, is also a stellar spot to pop in for glass of wine or beer with a few tapas. Wine lovers should be sure to pop into the expansive Lavinia wine shop on Calle de José Ortega y Gasset, 16, the largest in the city! Madrid’s Literary Quarter, known as either Barrio de las Letras or Huertas, is just off the tourist circuit while still being smack dab in the center of the city. This quaint neighborhood is packed with traditional bars and restaurants and host to many markets and street fairs. Where to Stay: Ideally located between the Paseo de Prado and Sol, Huertas is one of the most convenient neighborhoods to stay in. There are plenty of hotels to choose from as well as quite a few guest apartments and hostels. Recommended: The Westin Palace Hotel is a gorgeous place to stay– breakfast in under their incredible stained glass dome is an absolute MUST! Where to Eat: Traditional cured meats and cheeses are the specialty at Casa Gonzalez on Calle Leon, 12. At Terra Mundi on Calle Lope de Vega, 32 you’ll find one of my favorite Menus del dia, a set 3-course lunch menu for just 12€. For fusion, try L’Artisan Furansu Kitchen— Japanese/French fusion with a killer daily menú! Top Tip: To really get to know Madrid’s Literary Quarter check out Devour Spain’s Huertas Neighborhood Food Tour! Where to Drink: Casa Gonzalez has an excellent (and extensive!) selection of wines by the glasses. Prada A Tope at Calle del Principe, 11 is a traditional Leon-style bar that give stellar tapas with each glass of beer or wine. This up and coming part of the city is one of the best places to stay for diversity– hipster coffee shops coexist with countless Pakistani restaurants, delicious Arabic sweet shops, trendy new wine bars, and two excellent local markets. Where to Stay: To truly feel a part of this unique neighborhood, rent an apartment and live like a local for a week (or more!). Lavapiés is only steps away from the city center, so you’ll be perfectly located for exploring museums, monuments and restaurants. Recommended: If you prefer a hotel, the recently opened Artrip Hotel is a wonderful choice! Where to Eat: This area is home to two of Madrid’s coolest markets– Antón Martín and San Fernando. Both offer the option of buying excellent fresh fruits, vegetables and fish — or eating at the many food stalls inside. Top Tip: Don’t miss the 17 small art galleries hidden on Doctor Fourquet street. 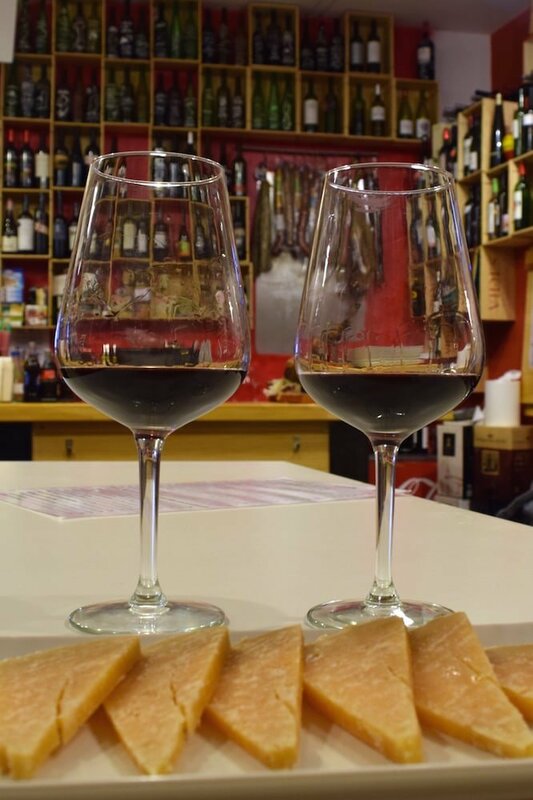 Where to Drink: One of the best wine bars in Madrid, a drink at La Fisna is the perfect way to start your evening out– a generous free tapa is usually included with your first glass of wine. Do you have a great suggestion for where to stay in Madrid? Any amazing local haunts that we missed? We’d love to hear about your discoveries in the comments! We always stay at Hotel Regina, Calle Alcalá, 19, just steps from the Puerta del Sol. It used to be an old, musty hotel where we would stay with student groups. Now they have totally remodeled the hotel, and it’s beautiful. It’s convenient, a 10 minute stroll to the Plaza Mayor to the west and another 10 minute walk to the Prado to the southeast. 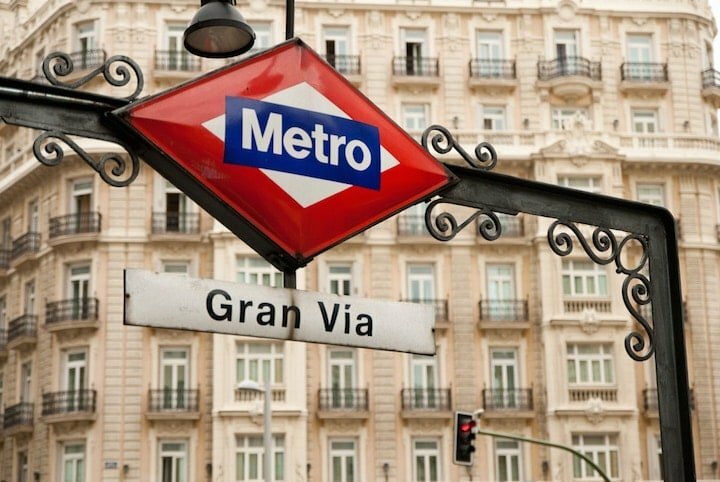 Many restaurants, tapas bars and breakfast places are just minutes away, and the Sevilla metro stop is right in front of the hotel. It is reasonably priced and the service is excellent. Great advice for the visitor! And the reason I love Madrid so much is that it is such a livable big city with many wonderful, walkable neighborhoods. Where I lived in mid-northern Salamanca was nice and quiet but a little more excitement was a short bus or metro ride away to the more bustling center of the city; or chill or classy eating and shopping even closer by a short jaunt into southern Salamanca and Goya. No love for Lavapies? I stayed there for six weeks a couple summers ago, and it made for a great glimpse of another side of Madrid culture (and still only a 5 minute walk from Sol). It’s true– another great neighborhood! Love Lavapies, but it definitely isn’t the only authentic part of town! I’m planning a trip next March, I was thinking of staying in Atocha. Prices are decent and its walking distance to the railway. Any suggestions???. This will be my first trip to Spain and wanted to visit Barcelona, Toledo and Sevilla and other towns, that’s why I”m leaning towards this neighborhood. I’m finishing my Erasmus year in Madrid and the truth is that my recommendation is that you spend most of your budget on gastronomy. Madrid has an excellent public transport network that connects every neighbourhood of the city. I’m staying in Moratalaz with a family I met through STUDENT GLOBAL RELOCATION, a useful portal for those like me who need a long stay, and every time I want to go for tapas to the center it only takes 25 minutes to get there by Metro. Finally I want to add a gastronomic recommendation that I have not seen, the boulevard of Ibiza is a fantastic area in which to take a caña.